With Siemens Active’s easy-to-use charger, CENTRA Active and Cielo 2 Active work all day on a single night’s charge. Imagine the freedom of not having to worry about batteries. That’s the freedom and convenience the Active rechargeable feature offers you. In fact, it’s the only hearing instrument of its kind that’s rechargeable. The stylish, intelligent Active charger is simple to operate. Just place the instruments in the charger – up to two instruments at a time. They don’t even have to be turned off because the charger does this automatically. 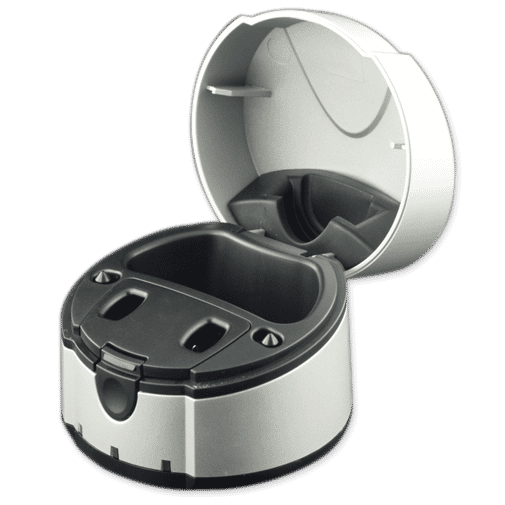 It also charges the instruments intelligently, indicating if the wearer has attempted to charge the instruments with non-rechargeable batteries, or has reversed the polarity of the batteries in the instruments. In addition to AquaProtect, the Active charger provides drying function that removes moisture from the instruments. So you can have even greater peace of mind. After just five hours of charging, the charger shuts itself off and the hearing instruments are ready to run for a full day and evening. Price includes charger and one pair of rechargeable batteries.